2014 Vmoto E-Max City 80L-3W. Picture credits - Vmoto. Submit more pictures. Comments: 48V/20Ah (NiCoMn) O2 Lithium battery. Range 30-40 km. 3-5 hour charging. Cargo scooter with two rer wheels, windscreen and roof. 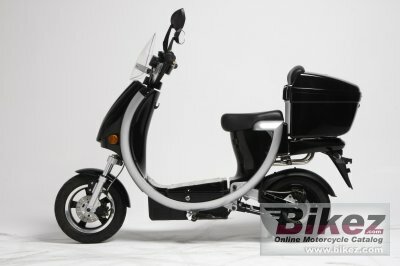 Ask questions Join the 14 Vmoto E-Max City 80L-3W discussion group or the general Vmoto discussion group. Send us motorcycle reviews for bikes you know and help other riders to select a bike suites them. This should preferabley be your opinion about motorcycles you have owned or at least tested. Tell about both what you experience as good and not so good compared to other bikes. In addition you can rate motorcycles according to reliability, engine performance, design and look, repair cost, offroad capabilities, racing track capabilities, touring capabilities, accident risk, value for money, and fun factor.